Political culture may be defined as the way in which a social group behaves politically and the nature of the political beliefs and values of its members. Political scientists have usually employed the term as a means of identifying what is unique or distinctive about the politics of a country’s population and likely to be of continuing significance in the evolution of their political beliefs and behaviour patterns. This is not, of course, to imply that a country’s previous political experience is the only factor that needs to be taken into account in explaining how its political system operates at the present time, or that it will necessarily be the decisive factor in determining its future political development. 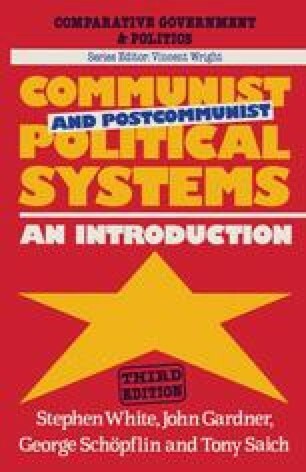 A country’s political culture, for instance, will certainly be affected by its level of social and economic development, by changes in the nature of its political institutions, and perhaps also by the programme of political socialisation which communist governments in particular have sponsored since they have come to power. Most scholars, none the less, take the view that a nation’s political experience over the centuries is likely to impart at least a certain bias to the manner in which its political system will subsequently evolve, and students of the communist states in particular have usually been agreed upon the continuing importance of the distinctive national heritages of these countries despite the great similarities between them in terms of institutions, economy and ideology.